A blog created to review the phones and plans available from Tracfone in order to help consumers get the best prepaid phone for their money. Also providing news, buying guides and free promotional codes for Tracfone. This blog site is the best place for Tracfone codes. They keep them updated each month and there are usually lots of options.\r\n\r\nThey also have a lot of other information I found useful, especially news about new phones.\r\n\r\nTracfonereviewer is a really good site if you\'re looking for information on Tracfone or cheap phones. 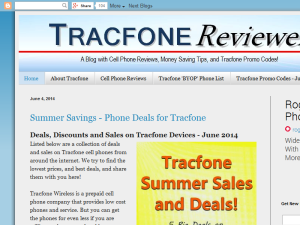 This what your TracfoneReviewer Blog Ad will look like to visitors! Of course you will want to use keywords and ad targeting to get the most out of your ad campaign! So purchase an ad space today before there all gone! If you are the owner of TracfoneReviewer, or someone who enjoys this blog why not upgrade it to a Featured Listing or Permanent Listing?